It is with a heavy heart that I recently made my first fin change in over 20 years. For decades, I’ve been diving in what I believe is the best dive fin ever produced; the Apollo Prestige. It’s perfect in nearly every way, but when Apollo began producing their wildly popular Bio-Fin, we Prestige loyalists were kind of left out in the cold. Late last year, I broke one strap too many and had to reach out to Dive Rite for a replacement. Knowing they may not be available much longer I ordered 4, plus the buckle mechanism for each. One thing I found right away is that the Dive Rite spring-loaded adjustable buckle isn’t molded very well. I have family in the injection molding business, so I have personal experience with quality control regarding plastic parts. This, by the way, seems to be a common trait with Dive Rite molded parts. The problem with the sucky mold job is that the straps are a major pain to adjust—if you can adjust them at all. Another problem is the straps themselves aren’t nearly as pliable as the originals. So, I started breaking the new straps within a few dives! So, for the first time ever, I started looking for a genuine alternative. My first thought was the Dive Rite EXP. According to the Dive Rite website, they’re back to the original monoprene. That sounds promising, and the new fins come with spring straps, so no issues with breaking their crappy rubber. But, without seeing them first, I just wasn’t willing to throw down $145, based on my previous experience with Dive Rite’s molded parts. So, I asked other divers whose opinions mean something to me. The Scubapro Seawing Nova was mentioned fairly frequently, and being made from the same plastic, I decided to go for it. The first decision I had to make was whether or not to go for the “Gorilla” version, which is supposed to be much stiffer. I elected for the original. To be honest, I think the Seawing Nova is ugly as hell, which is one reason I never gave it a thought. Ugliness aside, I got the biggest fin they make (XL) to fit my DUI Rock Boots while wearing thick socks to keep my tootsies toasty in our frigid Tahoe water. That basically makes them big and ugly, but they fit well over the boots. Stuffing my booted foot in is one thing, but I had real reservations about the spring-like bungie strap. I’d read they feel loose, and personally have never been crazy about spring straps for the same reason. Regardless, the foot pocket is perfect. Truly, the Scubapro Sewaing Nova is the first fin I’ve ever tried that really works with Rock Boots. In the water, they pull right on and stay on. The foot pockets are such a perfect fit that I don’t have the urge to tug on them during the dive like I did with my beloved Prestige fins. So, for fit, the Novas are VASTLY superior to every other fin I’ve owned. One problem I didn’t anticipate is how to carry the things into the water. Because of the arrangement and size of the strap parts, I can’t simply grab the straps of both fins in my fist and carry a deco bottle in the same hand. When I’m carrying two deco bottles into the water, it’s a bigger problem than it sounds. I eventually figured out how to hook the heel loop over individual fingers, leaving a couple for carrying the stage cylinder. It’s not as comfortable, but it works. Once we started our descent, the Novas felt bizarre, almost as if they were folding in half underneath me (they might have been). I felt out of control and, honestly, sad after having such high hopes for them. So, I slowed my descent and tried to get a feel for what was happening to make them feel so odd. I think it’s the way they hinge on those two fulcrum points, which is kind of the whole point of the design. I don’t like it, but I have gotten used to it. By the end of the first dive, I regained some hope that I’d be able to make them work for me. I really wanted to love them, especially with their heavenly foot pocket. I’ve got probably 25 dives in them now, and I do like to dive in them because they feel great. They’re secure, easy to put on and I’m getting used to the look. They don’t live up to the standard set by the Apollo Prestige. I believe it is because of the odd fulcrum. 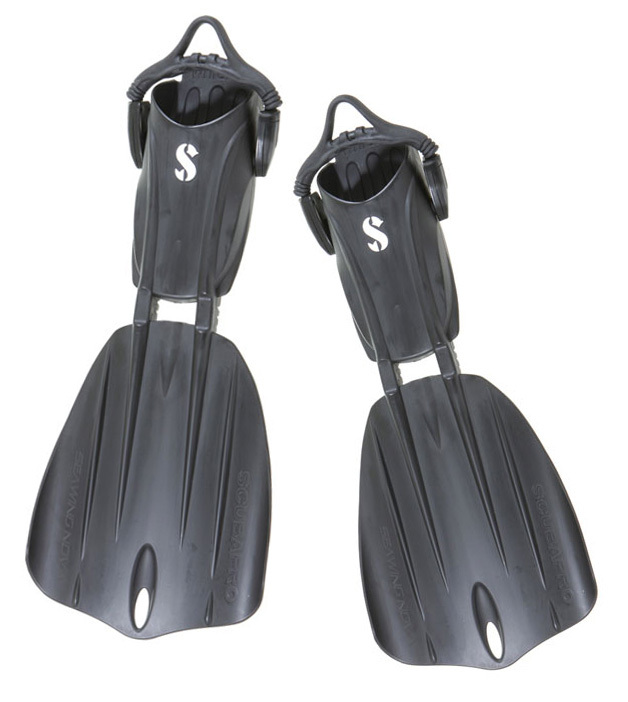 In my opinion, the Scubapro Seawing Nova bridges a gap between paddle fins and split fins that may not need bridging. They do provide more finesse for alternate kicks, in my view, than split fins. In the end, I believe if Scubapro would use that foot pocket and design a true paddle fin around it made from monoprene, they’ll have achieved dive fin perfection. Until that happens, the Seawing Nova is a decent compromise. Certainly, if you are thinking about buying new fins, but aren’t particularly interested split fins, they are worth checking out. As for Dive Rite, I don’t mean to be negative about the company. I own a lot of Dive Rite gear and think it is top notch in spite of a few poorly molded parts. One day I’ll get a chance to test the latest EXP Fins. When I do, I’ll be sure to post a thorough review. This entry was posted in New Dive Gear, SCUBA Gear Reviews, Technical Diving and tagged dive fins, diving equipment, lake tahoe diving, scubapro, tec gear, tech gear, technical diving. I have a 9″ DUI rockboots. Do you recommend a large size sewing nova to fit with well my boots? Personally, I use XL with Rock Boots. I have size 10 shoes. I think Rock Boots are sized the same. I could probably get by with large, but I have more options for thick socks with the larger foot pocket. It gets really cold in our local water in the Winter. Also, the fin pockets are shaped in a way that going up a little doesn’t make things feel loose. I don’t find the larger blades to be difficult to kick against like, say, the Dive Rites. I would love to convert my old Apollo Prestige fins to spring straps… need your advice on where I can buy the spring straps that will fit. I’ll do a step-by-step run through of how I converted mine sometime this week. I’ll drop you an email when I post it. I think you are probably right that the Gorilla version might be a better match for the type of diving I do. At the same time, power isn’t my issue as much as feel. I’ve got about 100 dives behind me with the Seawing Nova, and I do like the fin. It is my favorite strap system of any fin I’ve tried, and I love the foot pocket. It just flexes in a weird way that I’ve never quite gotten used to. I’ve since started using Dive Rite XT fins, and have converted all my old Apollo Prestige fins to spring straps. You are definitely right about the Gorillas though. I think it’s about time I took a pair for a swim. Apollo fins are not the worlds best fins. For most divers they are too heavy. Not my idea of the best fin. My vote is the Volo’s. I’m glad you like your fins, but for the record, I didn’t say Apollo fins are the best in the world. A said the Apollo Prestige fin is the best fin I’ve ever dived with. The Apollo Prestige was discontinued decades ago. The popular Apollo split fin (Bio-fin) is completely different. Tons of people love them. They’re not for me though. But, I do have to disagree with your blanket statement about them being heavy. They’re pretty close to neutral in the water, which is also true for yours. If we are talking about “most divers,” I can’t speak for them. I do know that probably a third of the people I dive with use Bio-fins. I just offer opinions here. I have quite a bit of experience, using virtually every piece of dive gear on the market, and people sometimes appreciate my perspective. For you to flatly state that I am wrong about an opinion is silly. Besides, “heavy” in what circumstance? Dry suit? Thin wetsuit? No suit? There are many factors that make one fin preferable to another. You should consider that before insulting another diver for choosing something different than you.